With hundreds of people at universities buying products from us every year, we wanted to give something back and make sure you can get the best quality displays at even better prices. 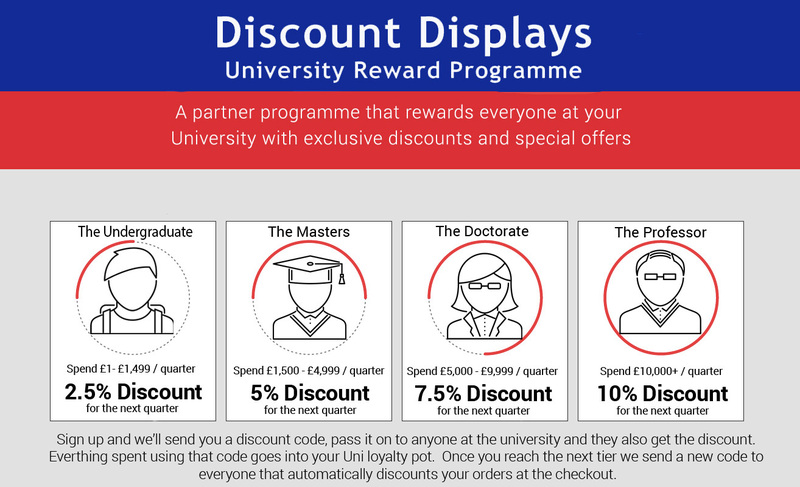 We had a think and came up with the discount displays university reward programme. This scheme is here to allow everyone at your university to get the best prices for their displays. Every time someone at your university buys something with Discount Displays, points will be added to the overall tally for the university which leads to great rewards. If you spend £1-£1499 in a quarter, everyone at your University is eligible for a 2.5% discount on all of our products for the entirety of the following quarter. And finally, a quarterly spend of Over £10000 and you get a 10% discount for everyone at your University on all Discount Displays products for the entirety of the following quarter! A truly “one stop shop” we have over 5000 products so are sure to be able to satisfy all of your displays needs.